Whisper Lake Cabin is a beautiful 3-bedroom, 2.5-bathroom mountain house/cabin with a gas log fireplace, high ceilings and timber beams and large windows that bring lots of light into the cabin. The great room, dining room and kitchen are all connected and open and easily accessible to the covered back porch. The cabin sleeps up to 10 guests, and is perfect for larger families, friends, or couples traveling together. Whisper Lake Cabin is part of the Sapphire Valley Resort Master Association and is perfect for guys or girls weekends, couples and families. The covered back porch is a great place to have a cup of coffee in the morning or a dinner for 4 at night. After dinner the fire pit area is a great place to hang out and tell stories under the stars. There are 80 acres of private land behind the house, that give lots of privacy while you are on the porch, or in the backyard area at the fire pit. The backyard is fenced with a locust pole and 2" mesh wire fencing system approved by the HOA, that is not escape proof, by any means for your dog, but will provide a deterrance for an escape into the woods. The back porch also features a lockable gate and is a great place to secure a pet outside as there are 2 covered porch areas for protection. Though it’s easy to get lost in all of the delights of the cabin, this property provides the perfect location for outdoor activities in the area. Summer is ideal for hiking, waterfalls, and golf or tennis. The Sapphire Valley Resort is only 4 miles away and gives you access to ski slopes, indoor and outdoor pools, exercise equipment, miniature golf, and arcade games! If you’re craving water sports, Lake Fairfield is 3 miles away with paddleboat and canoe rentals available through the Sapphire Resort. There are lots of great restaurants in the area and Cashiers is 6 miles away and Highlands is 17 miles away. 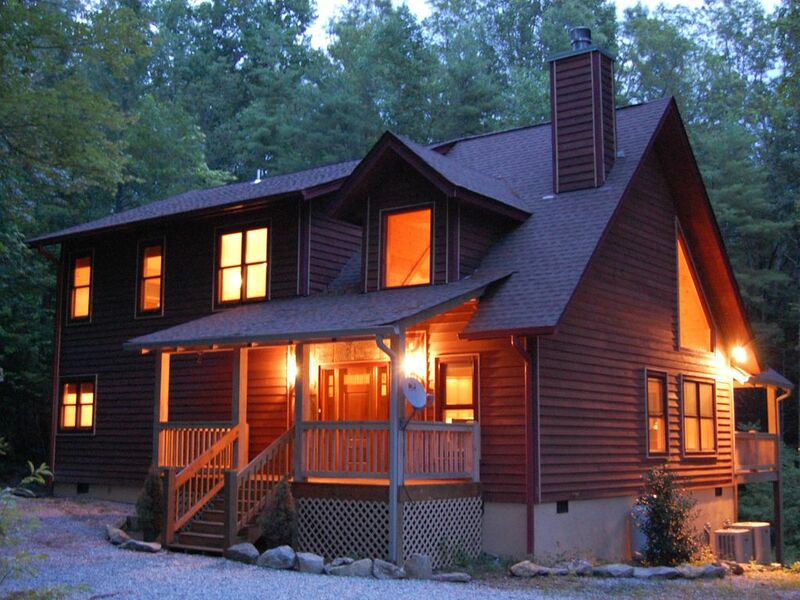 With so much to do at this beautiful cabin and the surrounding area, you’ll be sure to have a memorable stay at this vacation rental cabin! All the roads to the house including the driveway are paved, and 4WD is NOT required. High Speed DSL Wireless Internet provided. Fitness room is a part of the amenities offered at the resort which is a 3 mile drive from the house. You must purchase an amenities card for $2/day/adult for access. Large number of Dishes, plates, cups and utensils provided. Harman Kardon stereo system with 2 Klipsch Speakers. A headphone connector for an iPod or iPhone or iPad is provided. The grass backyard is fenced. Paddleboat/Canoe rental is available at Lake Fairfield. You must purchase an amenities card for $2/day/adult for access. Back deck area is covered and has seating for 4 for dinner. Ski Sapphire is a 3 mile drive away from the house. An indoor and 2 outdoor pools and hot tub is provided at the Resort which is a 3 mile drive away from the house. You must purchase an amenities card for $2/day/adult for access. No Smoking is permitted inside the cabin. Had an amazing time in Sapphire and the cabin far exceeded my expectations; very clean, equipped, spacious and secluded. A great place for kids as they had their own little getaway loft. Definitely will be staying again! The only reason give the stay a "4" vice "5" is because for some reason the upper bedroom, the one with the single bed ( not the one with the bunk beds) NO heat in that room. Hi David, I had no idea that the heat wasn't working in one of the bedrooms. So sorry that this happened. Next time, please let me know. My builder lives in the neighborhood and can easily swing by and address. My builder did visit the house yesterday, and checked out the heating system upstairs and said that it was working fine. My thermostats are computer controlled and there is one upstairs and one downstairs. I checked the logs on the upstairs thermostat and it appears that the heat setting was not turned on and the thermostat was set to fan only, during your stay. The downstairs thermostat was turned on and perhaps the upstairs was only getting heat from the downstairs thermostat? This home was exactly what my family and I were looking for. Spacious, secluded, comfortable, clean! We had the comfort we needed with our three children but also the cabin rustic feeling with the big fireplace inside and the fire pit outside. The back yard is fenced in and open so the kids had plenty of space to run around without the worry that they would stray off too far. The beds and pillows are so comfortable! Plenty pillows, blankets, towels. The kitchen was fully equipped. Check in and out was very convenient because of the lock code on the door. The owner was very responsive and gave detailed information and instructions to print out for using the WiFi, the fireplace, driving directions, etc. We had no issues with anything! We were sad to leave the cabin our family had an amazing time here and hope to return again. We had a wonderful time staying in this beautiful cozy cabin. It fulfilled my dream of having a Christmas winter getaway. The cabin was clean and spacious. Plenary of room for our party of 10. Brian was very easy to get In touch with, and made our stay a pleasant one. Sapphire is a sweet little town with quaint shops and restaurants. We enjoyed all of the amenities at Sapphire Valley Resort, and made memories we will cherish forever. Lovely home near Cashiers and Highlands, NC. Very nice homeowner who provided valuable information about the house. Kitchen completely stocked with anything needed to cook. Plenty of room for multiple guests. Nice master bed and bath with jetted tub and separate shower. In a subdivision which provided a sense of security and offered road plows & road maintenance which was a must since we got snowed in but if looking for a more rugged, private environment, this may not be the location for you. Hope to visit again soon. Property is located about 6-8 houses away from the lake and is not on the lake. We are 10 minutes or 6 miles east of the crossroads at Cashiers, and about 20-25 minutes from Highlands, and 20-25 minutes from Lake Glenville. Property is only 1 mile off of Rt 64 with easy access to everything. Property is close to Whitewater Falls and Gorges State Park. Property is used as the Owner's Second Home, and has nicer bedding, linens, finishes, appliances, and furniture than you would find in a typical rental home. Summer Rentals are Saturday to Saturday only (for both check-in and check-out dates) $125 Cleaning Fee and 11.75% Occupancy Taxes included in above rates for rentals of $600 or greater (rent portion only). $250 Damage/Security Deposit added to above rates (and fully refundable if no damages) 50% due at booking at 50% due one month prior to rental. 30-day cancellation policy for rentals less than one month. 90-day cancellation policy for rentals longer than one month.